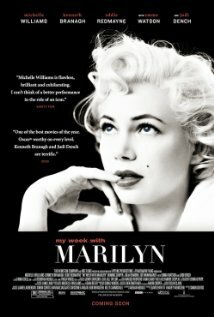 Here’s a review of My Week With Marilyn from SHH’s newest contributor, Brad. I recently performed my yearly movie lobotomy to save room for what we all know as “The Oscar season.” This season started a little late for me but I managed to squeeze almost all of them into my dome. Sad as it is, both Tinker Taylor Soldier Spy (recently reviewed by the Self-Hating Hipster) and My Week With Marilyn did not make the cut for best picture. Thankfully I still have a playful imagination and decided to host the Oscars myself, luckily finding one theater in upstate NY that isn’t buns; The Spectrum. The film follows Colin Clark (Eddie Redmayne), a young chap from England in the summer of 1956. Eager to break himself loose from a family full of historians, he works his way into a grunt job on the film set of The Prince and the Showgirl starring Sir Laurence Olivier (Kenneth Branagh) and Marilyn Monroe (Michelle Williams). From the get go we watch the struggles director Laurence Olivier succumbs to with Monroe’s particular acting style as she slowly reveals the pressures she faces more or less from work (acting) after her husband, distinguished playwright Arthur Miller, leaves to return to America. To counter that, Monroe playfully takes a liking to the innocent charm of Clark. The drama ascends steadily as others on set, including Monroe’s assistants who begin to question their relationship as Clark happily accepts the role of introducing her to his British lifestyle. The movie in its entirety is well done. No longer than a hundred minutes and getting to the point of conflict rather quickly reminds me that there are still films out there that can make you forget about the cell phone in your pocket (or purse) for an hour and a half to two hours. Michelle Williams does a wonderful job of depicting a side of Monroe that is unrecognizable to most people….at least to me. She’s spot on from the bleach blond hair down to the beauty mark and the soft voice, but the most impressive thing about the film is without a doubt the costume design (i.e. when Monroe first lands in England) that made watching Marilyn Monroe…I mean Michelle Williams so believable. The film does not hit the point of high drama or importance that most period flicks have hit in the past but it definitely highlights an era of film making that is long gone. It is worth paying the 9-10 dollars to sit and watch the movie in a dark room around a bunch of strangers. I would without a doubt recommend seeing this over most of what I have seen that is up for best picture this year. Overall I give the movie 4 out of 5 stars………(5 if it was in 3D).